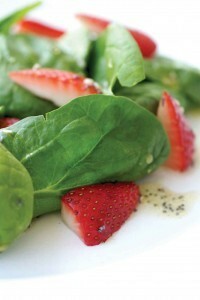 My Valentine’s Day menu starts with a simple strawberry salad. A fun way to get kids to eat spinach is by dressing it up with some fruit and a simple, sweet dressing. The sliced strawberries even look like little hearts—very Valentine’s Day appropriate. Place spinach and berries in a large bowl. Mix gently by hand. Fill a sealable container with vinegar, honey, oil, salt and pepper. Seal container and shake well. Pour dressing on salad immediately before serving and toss. Divide onto four plates. Nutrition Analysis: 70 cal, 3.5 g fat, 0 mg chol, 320 mg sodium, 9 g carbs, 1 g fiber, 1 g protein.